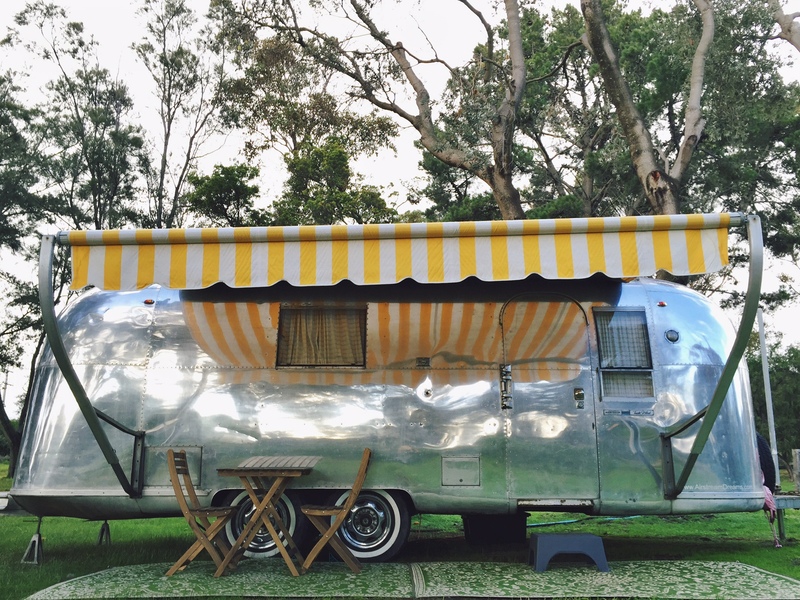 Have one of these retro caravans towed to a camping ground of your choice. The other campers will hate you. It was on a camping trip that I discovered my friend’s father was something of a nudist, confirming a dormant belief that the great outdoors are only great if certain things remain indoors. To catalogue the things camping has ruined for me – among them board games, summer, relationships – would take too long. Until recently, I hadn’t slept in the great outdoors for a decade. 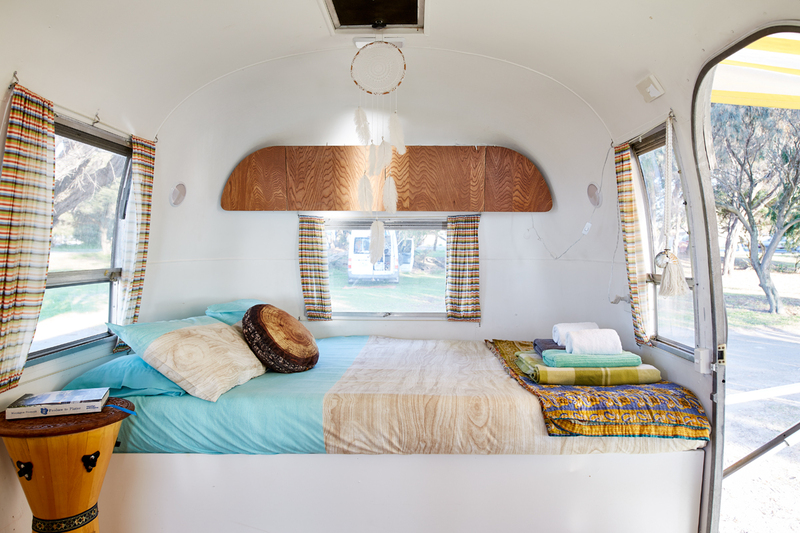 Then along came this shiny chrome 1966 Airstream TradeWind trailer, in which one could do all the things that campers do but in the ­hermetically sealed confines of a renovated ­Hollywood icon. Glamping is not camping. It’s glamorous. I know this because Jessie Curtis-Griffiths, who with her husband Scott runs Happy Glamper, has told me so. They’re based on Victoria’s Mornington Peninsula, a stunning bit of land that juts out along the eastern boundary of Port Phillip Bay and includes the seaside towns of Portsea and ­Sorrento. It’s a popular area for a summer holiday jaunt and during my stay the peninsula’s campgrounds are overflowing with those who’ve had to suffer the indignity of erecting their own tents. And then there is my trailer, an oasis in this desert of effort. She has been towed to my site near Rosebud the morning of check-in by the Happy Glamper crew. (The only work one does in this happy-glamping caper is booking your own campsite, which I’ve chosen from a list ­recommended by Jessie & co.) My trailer’s namea is Peggy Sue, an old-world blonde name that makes me think she is on the run from ­something. Probably trouble, or maybe an ex-husband named Garth. When I arrive at Capel Sound Foreshore Reserve, I retrieve the key from Peggy Sue’s lockbox. I can feel the eyes of the rest of the campers on me. I think they hate me. Maybe they feel sorry for me. In any case, it is hot, so I wander inside and switch on the air-con to drown out the judgment. Happy Glamper has other options. There’s Miss Myrtle the vintage caravan. Bell tents and larger Lotus Belle tents, the kind of arrangement you’d expect to find in outer Mongolia or used by the British cavalry in the mid-19th century. They were all onto glamping before the rest of us – which makes them, after a fashion, the ultimate hipsters. Peggy Sue has the lot, though. She has a living room, a queen bed, a bar fridge, toaster, kettle, plunger, plates and glasses. She has bench seating that can be made into beds for another two people. She even has an alfresco area, with outdoor chairs and a mat under her gay yellow-striped awning, perfect for people-watching. Before lunch, I head to Cheviot Beach, made famous first for a shipwreck and then as the place where Australia lost a sitting prime minister. ­Harold Holt went missing in the surf here in 1967 and was never seen again; the region has never forgotten it. It’s a 90-minute walk to the lookout at Cheviot Hill, and for the first hour I don’t meet a single person. Perhaps I am lost. Maybe I’m doing a Holt. It is distinctly possible no one will ever find me. It is a briefly appealing thought. Australia has never lost a prime minister on a chairlift, so next I take myself to Arthurs Seat to ride the new Eagle Skylift, which offers sweeping views of the peninsula on a clear day. Tickets are $24 for adults, and you know they have the breadth of the market covered because some of the first guests up the mountain were hot-pant enthusiast Warwick Capper and a visiting delegation from the South Korean parliament. I take lunch at the Georgie Bass cafe in Flinders before retreating to my trailer for an air-conditioned nap in the heat of the day. The term glamping entered popular usage early this millennium but the idea has been around for centuries, the preserve of kings and queens and the odd military commander who felt sleeping with the horses was an unnecessary ­addition to the job of professional dying. African safaris ­popularised it among the wealthy at the turn of the 20th century: people wanted to see lions and giraffes while maintaining access to a bath and four-poster bed. This is not an unreasonable position for the landed gentry who were not quite rich enough to import their own exotic wildlife from around the empire. Thankfully, glamping is more accessible today, and Peggy Sue’s rates cover not just the hire of the trailer but the effort others go through to deliver, set up and pack up so you don’t have to. My sister, a country girl to the core, heard about my glamping experience and promptly disowned me. She goes to ute musters and sleeps in a swag because, I am told, there is some kudos in roughing it. She is the kind of person who would go on a safari and demand to sleep in a tree next to a leopard. For the rest of us, those level-headed adventurers who prefer their outdoors with a dash of structural integrity, there is glamping. On my last morning in Peggy Sue I rise, lock the door and pop the key in the box. This is called “packing up” and I am very good at it. This camping business might be for me, after all.